I wish you had waited until I told you how beautiful you were. I wish you had waited until I told you that you had the most beautiful eyes in the world. I wish you had waited until I told you I liked color pink and that I loved chinese. I wish you had waited until we spoke about which place we’d love to travel. I wish you had waited until you played your hand through my hair…and I through yours’. I wish you had waited until I had known the taste of your tongue. I wish you had waited until I hugged you once. I wish you had waited until you wiped the tears off my eyes. I wish you had waited until we had created some more- just some more- memories together. I wish you had waited until I had told you how much I like you being around. I wish you had waited until I told you what you meant to me. I wish you had waited until I told you that I was so addicted to you that my mind knew no name other than yours. I wish you had waited until I told you how much I loved you. I wish you had waited until I told you that I cannot live without you. I wish you had waited until I told you that everytime I see you , my hearts sinks in little by little. I wish you had waited for a little more time just to see if I was alright. I wish you had turned back once. ONCE. I wish you hadn’t left my hand so simply as though I was nothing more than a mole digging the earth. I wish you had loved me the way you said you did. I wish you bothered to ask if I was alright. I wish I could unknow you. I wish I could take back every one of those moments I spent on you- thinking about you. I wish I could go back and delete that very moment I saw you for the first time. I wish I could erase you from my life- like you erased me from yours. I wish you had sensed the pain in the smile I gave you when you told me that ours couldn’t be taken any further. I wish I could be happy again. 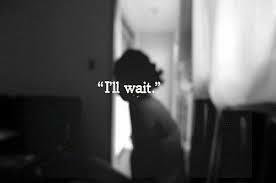 I wish you had waited to hear me say , “I’ll wait”. Lovely post! You make me wanna! Thank you for your comments on my blog. I am now following you….yes you certainly can write. Sam. You are the next Bridget Jones! No doubt. Mahek. Please stop writing so beautifully. Please. Shruttttz. You dont say. 1000 followers and a half. Please. 100o rs a month. Hmmm. Is that up to me? I remembered when I felt like this about my girlfriend. Then I realized it wasn’t her. Now she’s my wife. I’m glad I waited until I got out of the way. Damn these regrets 😦 I feel you. Most of us long to hear someone say they will wait, this is a beautifully written piece addressing the common desires of one clearly longing to be loved by another. I like this a lot. I loved the line, “I wish I could unknow you.”- so much poignancy in it…amazing! One of the best thing things read. I wish you knew how much I loved this…. I wish. I just wish. Very well said. I am coming out of a very short marriage. My husband turned out to be a fake and a fraud…a liar and a cheat. And I wish I never would have met him. But I learned a lesson through my heartache and pain…God love me more than any man could and He will always treat me the way I am meant to be treated. I knew all my life God wanted me to stay single so I could better serve Him and have a close relationship with Him. After I got married, 10 months later, I didn’t even know my husband anymore, he was a stranger to me, no longer the sweet, loving, caring, thoughtful man I married. I found out everything was a lie, that he cheated on me and walked away, leaving me in a horrible situation. He is from and lives in another country, he thought just because he ignored me that it married him single. He is even planning on remarrying in April and we are still married. Anyway, I learned that God is all I need and I am loving my relationship with Christ. He is the best husband a woman could ever want. He is my everything. I trust Him to see me through the valley journey I now walk and I know one day He will bless me greatly and I will be placed upon a mountain peak. Know that no matter what you go through in life…God loves you so very much and He will always be there for you. Im sorry for whatever happend from the bottom of my heart. I hope you continue to get nourished by His love. 🙂 You deserve his love. And yes. Well said. God always loves us. No matter what. He is there for us no matter when. And hence we dont need any person to remain alive. Well said. Awe, thank you. You are very sweet and kind. God bless you. Lots of love to you too. Just too good. Well written mithare! I absolutely enjoyed this entry! I know where you’re coming from its seems to be as a deep sorrow. You have such a good talent! Damn, I’m glad I stopped by, I felt that one hard. These words are the pinnacle of every love poem I have written. I am so glad! Thats really kind of you. Yup. I am definetly at it! Thanks ALOT! And btw. Great blog. Hey! You write amazinggggg! Read mine too. I think youlll like it. Did you reveal any of them? Haha. No. And he doesnt matter to me anymore so yeah. Hi. Yeah I don’t matter anymore so it’s okay. Jk this probably isn’t for me. This is just so brilliantly sad and sadly beautiful. Straight from the heart♥. Beautiful!! 1st of all I like the theme you’re using. I was looking for something like this. Thanks for that. Pain oozes from the writing and this dark background adds to the mood. Following you. Thank you for your visit to my blog and your follow. I notice you’re not writing at the moment. Hope all is well. Best. Chevvy. Wonderful post! I wish too! Hi Mahek, nice poem. I’m always amazed at how much harder sorrow hits us compared to the joys of life. Words written in sorrow reach much farther than those written in bliss, and it’s a strange occurrence with respect to human emotions! Oh. This hits hard. The regret, the pain, so vivid, so raw! at least the pain inspired you to write poetry. Packs a lot into a simple structure. Will follow. Thanks for following me.